Virtual tour syndication just makes sense. You know that when you generate more exposure for your listings, they are likely to sell quicker and at a higher dollar value. Who has the time to re-enter a single real estate listing into hundreds of syndication and distribution systems? Most people do not and that is why iLinks Media has direct access to the PicturePath™ distribution portal through Realtor.com and Move.com (formerly Homestore Inc.) we are authorized to feed ANY real estate virtual tour with a valid MLS number to the websites listed below free of charge as longs as the listing agent is a showcase member of Move.com/Realtor.com. Move.com applies a charge for each real estate virtual tour sent from us to these sites if the Realtor is a non-showcase member. The fee is waived if the Realtor is a showcase member with Move.com. If you are not a showcase member and would like your virtual tour sent to Realtor.com we apply a $25 fee at the time of your tour order and your tour will instantly be sent to Realtor.com and 90 other websites upon upload!! Yes 90 other sites!! Virtual Tour Traffic Reporting: Hit statistic reports show not only where virtual tour views are coming from but they also display which scenes from within the 360 tours are being viewed the most. The new hit reporting system also allows iLinks Media to automatically send out weekly virtual tour reports to any email address! These weekly hit reports will keep everyone involved up to date and able to monitor where marketing dollars and efforts pay off the most. See your “Hit Stats” 24/7 by clicking on the RTV Logo at the bottom of your virtual tour! Virtual Home staging is frequently employed by homeowners and real estate agents to help show properties to their best advantage. A virtually staged home shows better than an empty home. As wonderful as traditional home staging is there are some drawbacks it as well. Sometimes the staging may give prospective buyers the impression that window treatments or other furnishings are included in the home. Home staging can also be quite expensive. The cost to rent furniture and other furnishings in a down market with extended sale times can really add up. Usually the professional services are pricey as well which makes our virtual home staging product even that much better! This is where virtual home staging really shines. Virtual home staging is the process of taking digital photos of empty rooms and inserting digital furniture, window treatments, and other decorations. The attributes of each property are enhanced by the staging, rather than showcasing the taste of the homeowner. Virtual home staging costs a fraction of a physical staging and is a great tool to help showcase the home to prospective buyers. Most people looking for a home search the internet first and having a beautifully decorated home captures the interest of buyers and motivates them to schedule a showing with a real estate agent. Photos of empty homes are not as impressive as a staged home and may not help a potential buyer make an emotional connection to the property. Allows you to take our graph paper into the home with you, sketch out the home, fax it into iLinks Media and we will email you back your floor plan, which can be attached to your virtual tour. It's really that easy! Upgrade Your 2D Floor Plan to a 2D PicturePlus Floor Plan for a more visual experience! 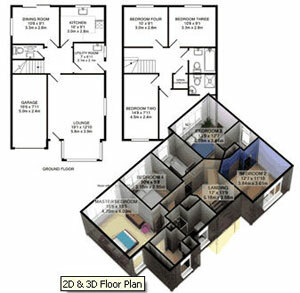 2D PicturePlus Plans: Make floor plans even more informative and compelling by using photographs. 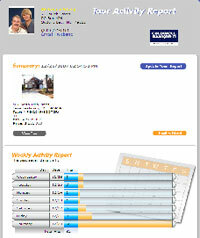 PicturePlus Plans bring properties to life and help viewers to visualize them more accurately. When the user places the mouse over a camera icon, a small photograph appears over the plan, illustrating the room pictured. Contact us for pricing. 3D Floor Plans: Stunning, visually-appealing 3D floor plans allow home buyers to easily visualize the design of the property. Contact us for pricing. 3D Walk-throughs: With the stunning technology, a viewer can 'walk through' a property on the web, as if they were there in person. High-quality computer generated videos let you experience a home and get a realistic feel for its size and layout. Contact us for pricing.